A wintry wilderness and dungeon adventure for 17th-level characters. The witch queens of Irrisen must abdicate their thrones every 100 years when their mother, Baba Yaga, places a new daughter on the throne. But one queen was unwilling to relinquish her rule, and led a doomed rebellion against the Mother of Witches. Afterward, Baba Yaga entombed her wayward daughter in an icy necropolis known as the Veil of Frozen Tears, along with a powerful artifact called the Torc of Kostchtchie, hiding them both far from mortal eyes. Now, almost 500 years later, the tomb has been found, and the race is on to plunder its treasures. Will the PCs follow Elvanna, the current queen of Irrisen, in her attempt to recover the Torc, or will they join forces with the demon lord Kostchtchie? What secrets does the Veil of Frozen Tears conceal? Can the PCs reclaim the lost artifact and keep it from those who also seek its power, or will they fall victim to the denizens of the tomb and end up as eternal guardians themselves? 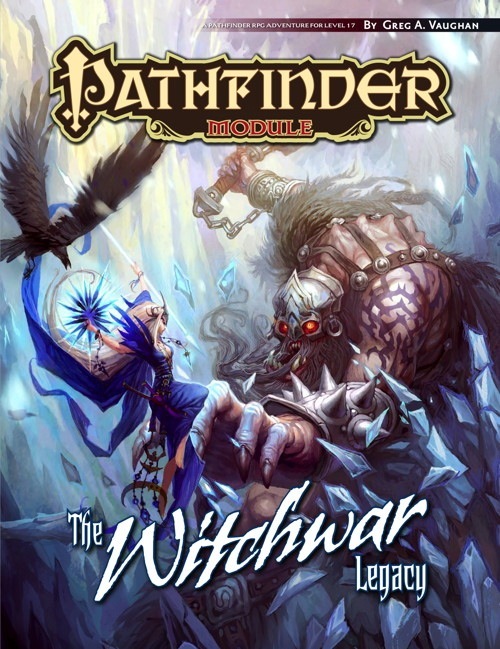 The Witchwar Legacy is an adventure for 17th-level characters, written for the Pathfinder Roleplaying Game and compatible with the 3.5 edition of the world's oldest RPG. The adventure features an icy necropolis frozen in time, cursed dragons, twisted giants, and the fell magics and devious riddles of the Queen of Witches herself! It also includes a description of the frost giant fortress of Holvirgang, and a new monster, the extraplanar scions of the titans called the Abyss gigas. This adventure is set in the northern reaches of the wintry land of Irrisen in the Pathfinder campaign setting, but can be easily adapted for any game world. 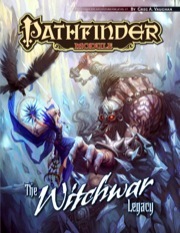 The Witchwar Legacy is sanctioned for use in Pathfinder Society Organized Play. Its Chronicle Sheet and additional rules for running this module are a free download (236 KB zip/PDF). Blood Freezes: Pray You're Dead First! This review is going to be one big spoiler, so if you're planning to play it, don't read on. Still here? I haven't gotten to playtest this adventure yet but if my group survives, I will. So how easily is it usable by a 17th-level party? First, the quest here is to retrieve a minor artifact. Very groovy for this level. There are two evil factions after the artifact, Queen Elvanna and the demon lord Kostchtchie. The PCs could work for either one or be in a race against both of them. So this adventure would work for evil, neutral, or good PCs if they want to gain a minor artifact. If they want to destroy it at the end, that would be an even bigger adventure. There are 21 numbered encounters here plus 1 that happens with ethereal movement and 1 at the end. Entering the location is only possible physically (no cold damage) or with planar travel (with cold damage inflicted). Other magical movement is blocked. The map to the dungeon is complex and spread throughout the module, but I could follow it through. A DM will have some flipping to do unless he has copies of the maps compiled. Also, due to the size of the monsters in the module, the scale is one square is 10 feet which makes sense and makes the Veil much bigger than the maps seem to show. Encounters include both traps and monsters. Depending on whom the PCs choose to negotiate and/or ally with they may have to fight everyone or may bypass some encounters or even add some allies. Many monsters are drawn from OGL sources and several have interesting twists including templates, curses, and class levels. I really liked the various monsters and how they all fit the theme of the adventure. There is an option for how to add a wendigo to the adventure and what might happen if the PCs keep the artifact (or turn it in). The adventure has a new artifact, a new monster, a new template, a settlement of frost giants, and four PCs (no wizard so no wish spell). From my read through, this adventure is excellent for high level PCs. It covers how divinations and magical travel function and how various NPCs and factions will react. Woven throughout the adventure is the history of both Irrisen and Baba Yaga. While Baba Yaga does not appear in the adventure directly, one dangling plot hook could lead the PCs to look for her after the adventure ends. Yeah, a high level module. What, no runelords then? Boo. I like how you're setting these in the places laid out in the various Chronicles products, however. Hurrah for Kaer Maga. I. CAN'T. WAIT. FOR. THIS!!! I've been begging for something like this for ages!!! lol... nah, gotta contest to finish. 17th level!?! Two of Baba Yaga's daughters?!? Sweet! A thousand carbuncles are scratching it out randomly in the dirt. Yep, still gonna buy it. They had me at "17th Level". Well, if you remember the old Dancing Hut adventure way back when...they are the same thing, he he. I'll be curious to see how much adventure you can fit for 17th+ level characters in a 32 page module. I think a fair amount. We fit a lot of adventure into this amount of space every month back when we were doing Dungeon, after all. We've got plenty of practice making high level games fit! Could anyone tell we where the mock-up art work comes from, and what Valeros is fighting? I *think* it's from Flight of the Red Raven. Excellent. Now we need to make sure this sells well so we get more high-level modules. Which then opens the gates of possibility for an epic-level book. Irrisen and Baba Yaga will be 2 excellent draws to sell this adventure. Good choice, Paizo! I wonder if the witches will use the new base class as a baseline, or is "witches" just descriptive text? There's a reason we haven't actually done much stuff with Irrisen yet. Because we don't yet have a locked-in witch! AKA: they're witches, APG style. I love the synopsis! Now this sounds like what a high-level adventure should really be like. I can't wait for this to come out. Time to let the Okie out? Nothing here but us carbuncles. I think the first carbuncle* roadkill I ever saw up-close and personal was on a road trip to Ft Sill. *First ed. carbuncle, as opposed to the lovable Pathfinder lizard. Good recommendation, Liz. I'm looking forward to this module, too. I've been playing around with very similar ideas, myself. In fact, that's part of what I've done with the fiction I had published in Wayfinder #1 and #2. You, sir, are a machine. Edit: got the "Dancing Hut" adventure off off Evilbay some years ago... gotta integrate that once this comes out! It's got Irrisen (yay for mythic Finland/Russia), the Baba Yaga, and the Witch Queen (yay for a homage of Queen Jadis/the White Witch), and it'll be the first high-level standalone module Paizo has done, so of course I'll have to get it. Dumb question while I'm here: where all has official info on Irrisen shown up? Have you checked PathfinderWiki? The references section at the bottom will list all the sources that have been incorporated into the article. So... um... whose the father? Thanks. I keep forgetting that it exists! Don't say that, the Wiki is delicious. In related news, hello everybody. Well, this should be nicely timed. My group should be just about done with Rise of the Runelords when this becomes available. I have to admit, I had no idea how to write up something for a group that high level. So this is good. What kind of chances are there that this might work as an extension of Kingmaker, for playing after the campaign has wrapped up? Or possibly as something to do in the middle to help on XP/equipment, alternately? Is there any other books that reference the Witchwar? Holy crap, this just keeps getting cooler! Of course....right as I have just started doing a game set in the Lands of the Linnorm Kings....now I have some high level adventure support to go along with it! Witches, Demon Lords...this sounds freaking awesome! Holy Shyte! That cover rawks! Another cover I just LOVE!